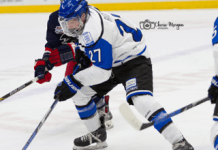 PENTICTON, BC-The Penticton Vees are one win away from returning to the Fred Page Cup Final, after a 3-2 overtime win over the Vernon Vipers in Game Five of the Interior Division Final Friday. Captain Nicholas Jones scored the game-winner, deflecting in James Miller’s point shot, eight-minutes into OT, sending 3,563 fans into hysterics. The Vees now lead the best-of-seven series 3-2, with Game Six Saturday back in Vernon at Kal-Tire Place. Gabe Bast and Taylor Sanheim scored in regulation for the Vees and Mat Robson stopped 26 shots and was named the game’s second star. Cameron Trott and Jagger Williamson replied for Vernon, as they head back home in need of a win to extend their season. Darion Hanson was tagged with the loss, as the Vipers goaltender turned aside 34 shots but took home third star honours. It was the first come from behind win of the series for either team, as it was the Vipers jumping out to a lead six and a half minutes into the first on the power-play. Trott fired a shot from the left-wing circle, which appeared to be redirected in between Robson’s legs at 6:34. The goal, credited to Trott, was his third power-play goal of the series. Penticton responded well after that goal and quickly, as they tied it up on a power-play of their own, just 77-seconds later. After Taylor Sanheim drew an interference penalty, it was Gabe Bast firing a dart from the blue-line that found its way in over Hanson’s blocker at 7:51; Bast scoring his fourth of the post-season. The Vees took the lead quickly in the second period – literally. On the opening shift of the second, Turner Ripplinger fed the puck out front to Taylor Sanheim, who just managed to poke it underneath the goalie’s pad and across the goal-line 13-seconds into the middle frame; Sanheim’s fourth goal in six games. Vernon tied it up just before the five-minute mark after Jagger Williamson shoveled in a loose puck from inside the crease. Robson thought he had squeezed Jesse Lansdell’s shot but the puck bled through the other side and sat there for Williamson to tap it in at 4:48. Late in the second the Vees had an opportunity to go ahead 3-2 on a five-on-three power-play for 70-seconds but nothing materialized. Their best chance came off the stick of Grant Cruikshank during the power-play sequence but his rang his shot from the right-wing off the post. Vernon was also handed a late power-play in the second but it was the team short-handed with the best opportunity. After Hanson misplayed the puck trying to catch Penticton on a line change, Jones and Joe Leahy came in on a two-on-one short-handed but they couldn’t convert. Jones and Leahy played pass before Leahy tried to push a backhand past Hanson but the goalie swallowed it up. Both teams traded chances in the third period but neither side was budging. Penticton’s best opportunity came off the rush, as Amonte came flying down the left-wing but his off-speed wrist-shot slid underneath Hanson but nailed the base of the post on the far-side. Vernon had a great chance inside the final half minute of regulation, as Cooper Watson fired a heater right off a face-off from the right-wing but Robson managed to get a shoulder onto the rising shot and steer it out of harm’s way. Sixty-minutes wasn’t enough to break the 2-2 deadlock. Almost midway through OT, the Vipers were charged with icing and the Vees immediately took advantage of the situation. Jones won the face-off back to the blue-line, and after Griffin Mendel James Miller played pass, it was Miller leaning into a one-timer. Jones slid in front and had the point-shot go off his pants and up and past Hanson on the glove side at 8:40; Jones scoring his team-leading seventh of the playoffs. Notes: The Vees handed the Vipers their first loss in seven games when scoring first, as they’re now 6-1. Of the Vees now nine power-play goals in the playoffs, eight have been scored at home. Bast and Jones each have two goals and four points in five games against the Vipers. The Vees now look to clinch the series tomorrow night, Saturday April 8th, in Game Six at Kal-Tire Place in Vernon; puck drop is 7 pm.